St. Moritz, 28 January 2017. Team Badrutt’s Palace Hotel and Team Cartier are the winners today of the second matches of the Snow Polo World Cup St. Moritz 2017. 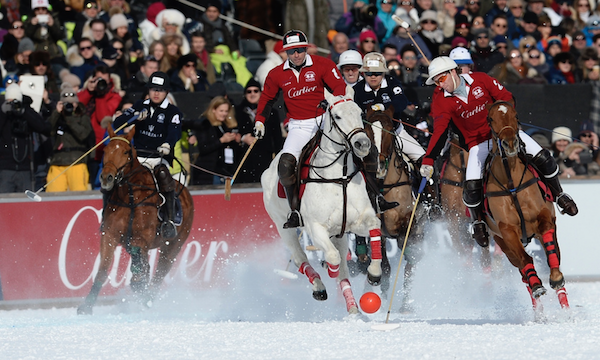 Crisp and clear weather made for excellent conditions as the 5,000 spectators gathered on the frozen Lake St. Moritz to enjoy two competitive and entertaining games of polo whilst bathed in Swiss sunshine. Today’s duo of matches began with The Maserati Cup with Team Badrutt’s Palace Hotel, fresh from yesterday’s victory over Team Maserati, who today took on Perrier-Jouët. Melissa Ganzi’s Badrutt’s Palace Hotel team have taken to the ice with style and Alejandro Novillo Astrada is worthy of particular note as he has performed as though this is his 10th time to St. Moritz and not his first. He is more than ably backed up by the young American Jesse Bray whose forward play and flamboyant style has been invaluable, whilst the strength and consistency of Swiss player Tito Gaudenzi has seen goals notched up with seemingly effortless ease for the black-shirted Badrutt’s Palace Hotel team. Team Perrier-Jouët came out onto the ice today with something to prove, having been defeated by the might of Team Cartier yesterday. After not playing yesterday due to a leg injury, Luca Meier joined his brother Fabio and the young Swiss fraternal duo launched a determined attack as team mates Lucas Labat and Fabian Bolanterio played with verve and style, giving their opponents a challenging match. The final score of 6-2 in favour of Badrutt’s Palace Hotel certainly did not reflect the velocity, rapidity and excitement of the game, which saw Perrier-Jouët have near misses that could have so easily ended in a closer score. Badrutt’s player Jesse Bray was delighted to have secured a second win of the tournament commenting, «It is a great tournament to be in, I am super happy that the team played awesomely today. It was a tough game throughout». Luca Meier, gracious in defeat, commented, «We were a little bit unlucky and Badrutt’s Palace Hotel were better in the end». In today’s second game, Team Cartier, featuring last year’s winners, Dario Musso and Rommy Gianni, took on Team Maserati to compete for the Deutsche Bank Wealth Management Challenge. Having beaten Perrier-Jouët in the first game yesterday, Team Cartier were keen to extend their momentum and book a place in the final of The Cartier Trophy tomorrow. Although Team Maserati had lost their game against Badrutt’s Palace Hotel yesterday, with flamboyant and expressive play, the team had certainly stolen the hearts of St. Moritz and established themselves as crowd favourite. The stage was set for another Snow Polo World Cup epic. Despite concerted pressure from both teams, the score was still 0-0 at the end of the first chukka, a first for this year’s tournament. Team Cartier however found their form in the second as Chris Hyde and Dario Musso deployed their characteristic sharp shooting to bring the score to 3-0. Musso’s second goal was a particular highlight as he cleared the ball from his own goal line before running the length of the ground at full stretch. Musso’s form continued immediately into the third chukka as he curled in a goal from over 50 yards out, sealing his hat trick of field goals in the match. Team Maserati were quick to reply with a dramatic field by the hand of James Beh which in doing so, galvanised his sons into action. The fired up crowd was subsequently treated to a final chukka of impassioned play from Team Maserati as the crowd got behind their favourites. Despite an impressive field goal from Chevy Beh, Team Maserati were unable to recover from their earlier deficit with Team Cartier booking their place in tomorrow’s final, 6-2. On Sunday, Maserati will play Perrier-Jouët (12h00); Cartier and Badrutt’s Palace Hotel will fight it out for the coveted Cartier Trophy (14h15).